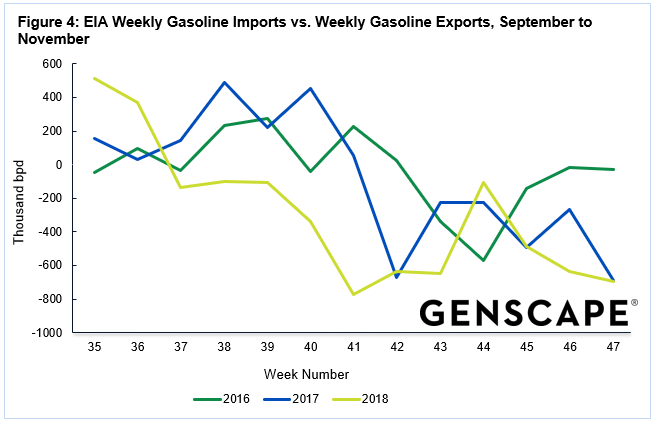 This disparity between the two numbers appears to be related to the recent decrease in gasoline imports and increase in gasoline export levels, two factors that the EIA includes in its formula to calculate Products Supplied. By adding imports and subtracting exports, this shift change in recent import/export patterns has had a depressive effect on the Weekly EIA Products Supplied level, showing declining year-on-year demand during a time of sharply falling prices at the pump. 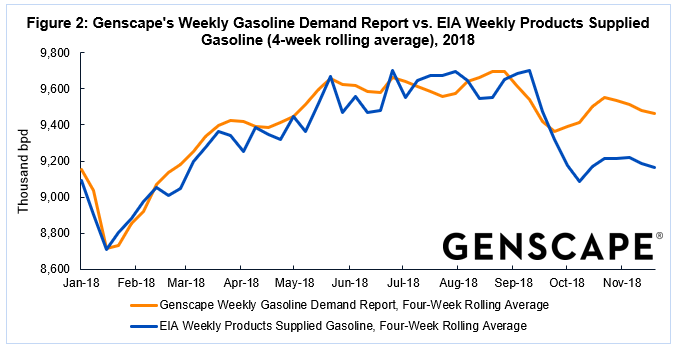 The basis for the Genscape Weekly Gasoline Demand Report is total U.S. rack liftings, sourced from our Supply Side data. These rack liftings represent the movements of gasoline from secondary (rack) terminals to retail stations. Our team calculates the total weekly U.S. rack activity and then adjusts the number for missing coverage using the coverage percentages between Supply Side total U.S. monthly average bpd and EIA Products Supplied monthly. Related: Is This The Most Crucial Factor For Oil In 2019? 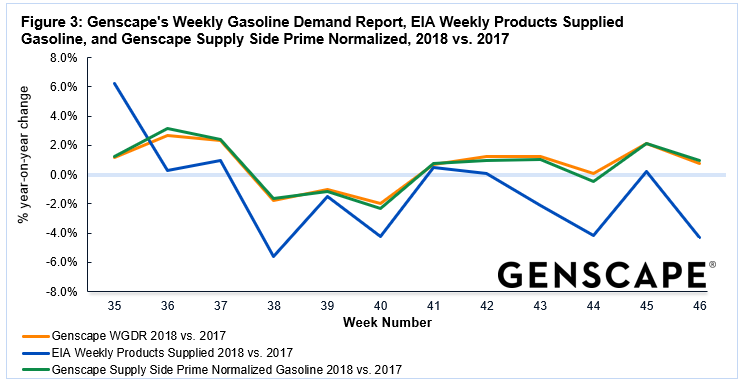 Our team compared the difference between its our Weekly Gasoline Demand Report data and EIA Weekly Products Supplied for Gasoline, and the difference between EIA Weekly Gasoline Import and Export volumes for week ending August 31 to week ending November 23. 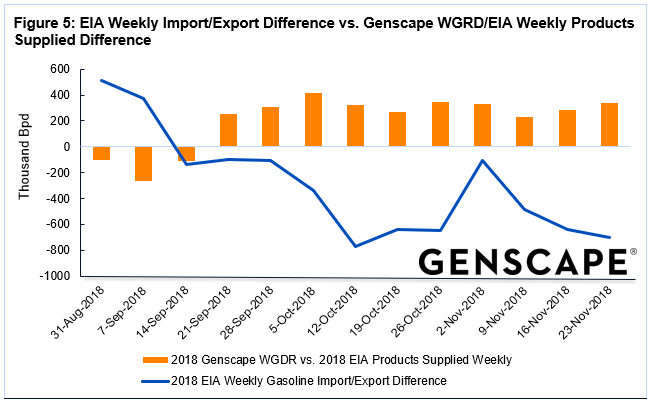 An analysis for correlation showed that there is a strong inverse correlation coefficient (-0.74) between the difference in the Genscape/EIA weekly demand data and the difference between EIA weekly gasoline imports and exports. 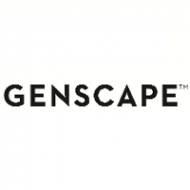 As this import/export difference declines on a weekly basis, the residual between Genscape’s weekly U.S gasoline demand calculation and the EIA Weekly Products Supplied number increases. Related: Could Iraq Be The Next OPEC Member To Exit? Our Supply Side Monitor and Analyst data provides insight into PADD- and rack-city refined product volumes and average prices into PADD from actual transactions at the rack level, where gasoline and diesel are distributed from secondary storage terminals to retail stations. 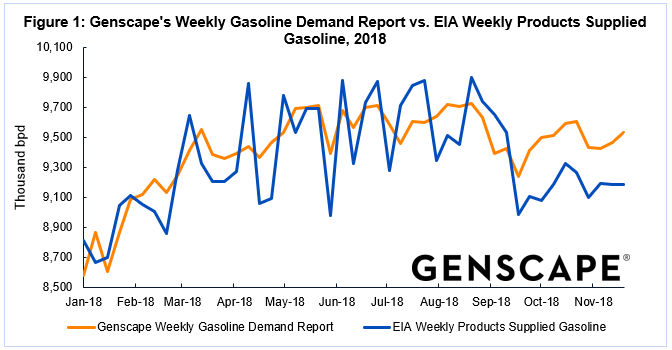 In addition, our Weekly Gasoline Demand Report provides total U.S. gasoline consumption on a weekly basis on Mondays at 10:30 am ET, two days before the EIA. The analysis uses our Supply Side Monitor hourly data, sourced from actual rack liftings of gasoline (e.g. truck movements of finished gasoline from racks to retail stations). Are Floating Reactors The Future Of Nuclear Energy? Bottom Fishing For Oil Stocks? Stick To The U.S.